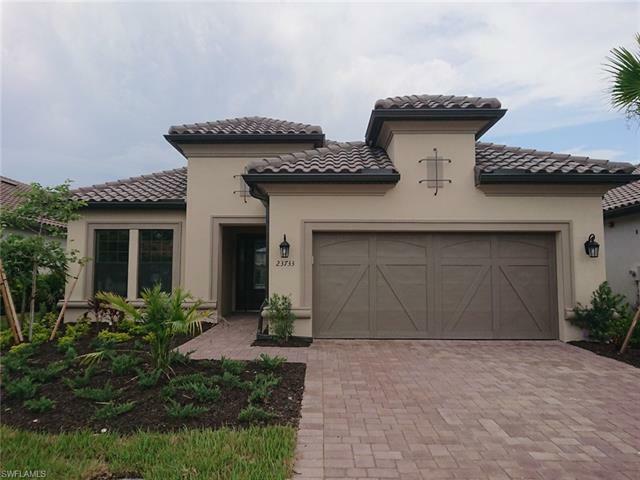 23733 Pebble Pointe Ln, Bonita Springs, FL.| MLS# 218018568 | Southwest Florida Residential Real Estate for Sale. Ready Now!! Photos of Model Home -The open well designed luxury home lends itself to entertaining with friends and family with many beautiful outdoor living features. The upgraded kitchen with a separate prep island is definitely the hub of this home. It comes complete with granite, stainless steel gas appliances, 42â upper cabinets and butler pantry. It has a two car with 4 ft extension, extended lanai with pool waterfall and summer kitchen rough with gas stub-out for outdoor kitchen. Beautiful Pool area with pavers.and beautiful upgraded tile floors throughout in main living area . Very popular floor plan in sought after location. . Show and sell.